The Italian company Veco, internationally known for its products strictly linked to the nautical world, such as the Frigoboat refrigerators and the Climma air- conditioning systems, now presents the new modular air conditioner called the Mistral 750. The characteristics of this modular system consist in the possibility of setting it up to meet personal requirements, since it has one main unit and a series of fan coils for cooling each individual room. Usually marine air-conditioners always work on the same air contained in a specific environment, with the inconvenience that recycling involves change of air being entrusted to any opening of doors or portholes. So every time a door or porthole is opened a large quantity of humidity enters internal areas to the detriment of comfort and well-being. The Climma Mistral 750 operates in a different manner compared to standard air-conditioners. Air is taken from outside, dehumidified, taken to the neutral temperature of +22° C and then introduced into the room. 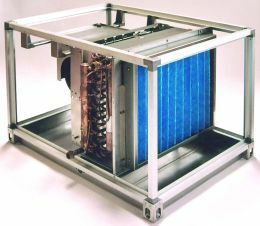 Two stages form the dehumidifying process, however the main stage consists in passing the air through a finned heat exchanger linked to a refrigerating circuit, in which pre-cooled water circulates and that is then also taken to a neutral temperature of + 22° C. The system also includes a proportional valve that regulates the passage of water as it enters, thereby guaranteeing the air's constant temperature in the initial stage. 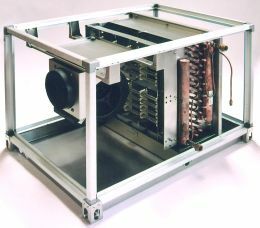 As it is released, however, the air's temperature is maintained constant by a resistance coil modulated in the PWN system. The air is distributed through a series of coils in the desired premises without those unpleasant temperature variations that usually characterise non-modular systems. Thanks to this new system and to the correct positioning of channelling and fan coils, it is possible to create environments, even on large boats, that are comfortable and free from stale air, allowing both temperature and humidity levels to be monitored and modified at pleasure. The Mistral 750 technical specifications include a capacity of 45,000 Btu/h, air capacity equal to 750 mc/h. For further information please contact: Veco; via G. Cantore 6/8; 20034 Giussano (MI); tel. +39 036235321; fax +39 0362852995; website www.veco.net; email info@veco.net.